Stumbled across this story about a man named John Rukavina who is a member of Chicago’s Local 1 ironworker union. John just turned 75, but in these videos and interview here, he is 74 years old – and still climbing up on the top of the skyscrapers in Chicago to install new antennas. John claims to have worked on every high tower in Chicago since 1964. This drew my interest initially because I’m a rock climber and love heights. But yet, I would not be able to do this job primarily because most of these workers bypass their protection when moving around so they can move more freely and quickly (they do secure themselves in situations like you’ll see in this video). I’m used to being completely tied in the entire time – but I also expect to fall (even if I try not to). That’s just part of the sport, but not supposed to be a part of construction. Then it began to dawn on me…. I realized that these are the people who are the salt of the earth, the back bone of this county, the union workers. Due to the Republican Party, they are now in risk of becoming extinct. Now, watch these videos – careful of the vertigo – and you tell me that the people that do these jobs do not deserve the protection of their union. Do you want them to be treated like the employees of WalMart are treated? That’s what will eventually happen. Corporations care naught about anything but their profit margin. October 5th, 2012 – These are some extraordinary video clips of the recent installation of the new ABC 7 antenna atop Willis Tower. The amazing shots were taken by tiny cameras on the ironworker’s helmets, the antenna sections themselves, and another helicopter. The video features Local 1 ironworkers John Rukavina and his nephew Bob East. Director Stephen Brown and Zoo City Productions were filming the entire event for a documentary entitled “Cowboys of the Sky“, which chronicles the journey of 74-year-old Local 1 ironworker John Rukavina. Doing an installation in that environment is tough enough for an ironworker. Doing it with a helicopter makes it even more difficult. The stunning video leaves no question of John’s skill, experience and fortitude. Below is the trailer for the “Cowboys of the Sky” documentary. Fascinating as it features clips of the “old days.” Along with some truths about what and who you had to be up at these heights. Lastly, below is a wonderful interview with the great John Rukavina. Although it is a radio interview, and much of this is audio, there is some video provided which are clips of the two above. It’s the audio that is the best part and worth listening to. Rukavina is the type of man I could sit down and talk with for hours and hours and hours and hours…. October 27th, 2012 – Listen to ‘The Voice of Chicago’ WGN Jonathon Brandmeier and hear his interview with one of his local heroes, “Tower Dog” John Rukavina. 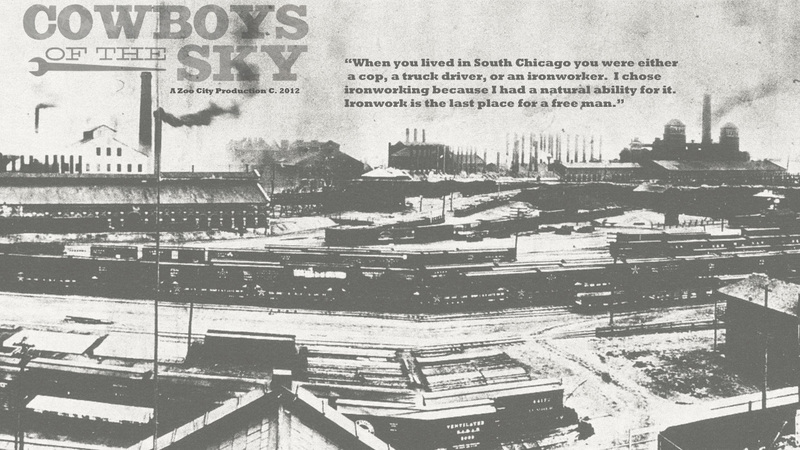 They discuss the October topping out of the Willis Tower antenna and the making of this film, Cowboys of the Sky. Enjoy some excerpts from the show accompanied by sneak preview footage. From kangaroo’s in backpacks to jumping off the tower, hear what this radio host has to say and speculate to John Rukavina. No one in my family is union. Nor do I know anyone personally that is a union worker. I honestly do not know much about them except for what is in the news. When I compare what companies like Walmart do when it comes to “caring” for their employees, and what unions do to make sure their employees are paid a fair amount and receive benefits, I don’t want to see the unions go away. For many years, I questioned whether unions needed any longer as I had thought our society had moved beyond the needs for unionization. But now I think we need it more than ever. There are too many politicians who feign that unions are making it harder for people to find work when in reality, these politicians are only speaking for the corporations, not for the people. Very few companies have the morals as Costco has and will pay their employees peanuts. I’m sure there are portions of collective bargaining that may be improved upon, or even completely changed, but if the corporations gain complete control, we have all lost. Now, please check out “Cowboys in the Sky” website. I don’t have vertigo, per se, but high precarious places like that (those that are manmade) really unnerve me. Mountains are supposed to be high, and they are still “mother earth.” There’s something unnatural and scary about a manmade thing sticking up that high. Hence my awe of these guys, the men and women who build and maintain towers and skyscrapers like this and bridges like the Golden Gate, who walk high steel like a city sidewalk. I love long, high exposed climbs, but I don’t think I could do this type of work. It’s amazing what they do, yet I never hear of anyone falling to their death. Ppl do but it’s rare. It’s a dangerous job but we are all highly trained. Seeing this makes me realize how much I take my city’s skyline for granted.It really is beautiful and I extend a special thank you to John and ironworkers like him for maintaining the antennas on all the skyscrapers. No kidding. I never really thought about it until I saw the work in action. What an amazing profession and just watching the videos made me nervous. Talking with artist friends of mine, we have noticed in this country that we are losing entire skill sets. This goes along with our country’s inability to make anything worthwhile anymore. That’s true. My parents owned their own business and it was a blue-collar business. They would install windows, store fronts, auto glass, sold paint and wallpaper, and a few other like items. Everyone was proud of their work and did it well. If they didn’t, they didn’t last long. Dad’s “right-hand man” (for lack of a better description) was employed long before I was born and was still there when they sold the business decades later. And he drove 70 miles every day, too. This is what I love. I’m a member of IWA 263. I joined in my early 20s. Now, I’m almost 40 and will hop an I-beam in a second. I’m a highly trained and experienced connector. It’s crazy to think how far we’ve all come. To my brothers and sisters ~ thank you. It’s a dangerous job but we do it. We love it. We wouldn’t have it any other way. God Bless out there.